It's that wonderful (or wonderfully stressful) time of year - the cooking Christmas dinner time of year. For those of you who are brave enough to prepare it yourself (or who aren't lucky enough to have it prepared by mums or grans), Thames Water has a Christmas request. Please don't pour turkey fat down the kitchen drain. 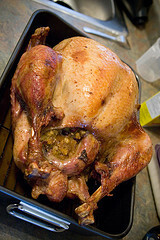 Apparently, our sewers will see an estimated five hundred tons of turkey fat sent into sewer systems that were not designed for fat of any kind. Five hundred tons. That's a LOT. Here's the tip that our mum taught us when it comes to turkey fat - pour it into a tin and put it in the fridge until it cools and hardens. Then just chuck it in the bin. It stays solid and won't make a mess. And it must be scraped away. Oh, that's right. Thames Water wrote a song to inspire you. Here's the full version. Sadly, no audio. Maybe that'll be our Christmas wish for next year. Delicious turkey photo courtesy of forbescreative's Flickr photostream.